Releated:tanks for water storage,rain water storage containers,Â Â water tank uses,water tanks plastic for sale,Â square plastic water storage tanks,stainless steel hot water. 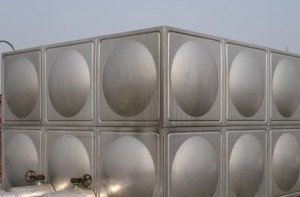 1, stainless steel water tanks generally use SUS304 stainless steel sheet material, stable physical and chemical properties, water pollution, to ensure clean water quality. 2, stainless steel stamping stamping, high strength, light weight, appearance clean, beautiful and elegant. 3, the water tank board is generally high-nickel more than 8.04 3042B board, the surface smooth and beautiful, easy to clean. 4, due to the surface of dense oxide layer, excellent corrosion resistance, sealing performance. 5, impact resistance, seismic performance. B, stainless steel water tank installation, construction and acceptance of professional welder on-site argon arc welding. Construction site has a standard power supply. Around the water tank â‰¥ 500mm maintenance space. Appearance inspection without rust, no pollution: fill with water 2-3h, no significant deformation of the box, no leakage of qualified weld. When piping, do not apply excessive load to the pipe inlet and outlet. Do not apply the weight of the valve and the large diameter pipe directly to the water tank outlet. If necessary, set the pipe support: the expansion, contraction and vibration of the welded pipe must be equipped with flexible flexible joint. 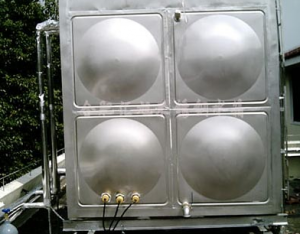 Stamping stainless steel welded steel tanks with stainless steel stamping out the ribs and welded with stainless steel welded the whole, simple structure, strength, and can create a larger capacity of the water tank. Because the box with stainless steel plate welding, completely cut off the sunlight, it will not breed algae. So that water is always kept clean.